Interests:Hardware, Software, Alphas and Betas, OS Mods, Windows 8.1, Windows 10, Linux, Games, Fun, Friends. Have you seen that tool ? I gave it a try and loved ! I found that GPU2 servers arent assigning, but GPU3 ones are. Weird ! 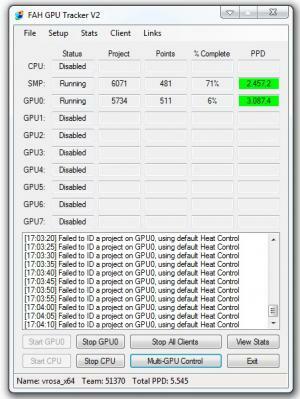 ATi R800 chips natively use GPU3 (with OpenCE support), but with the "-force GPU -R700" switch GPU2 client works fine too ! 5500+ PPD... really not bad ! It doesnt estimate the clients PPD corectly, though I dont run it 24/7, but it's still a very handy tool. Interests:I'm a Dutchy, that means I'm not a German (which doesn't sound/look the same to me!) also, being a Dutchy means I'm an idiot... sort off! And I def. need to get a real life again... I'm bored with my current life, ideas can be pm'd to me! My GPU is giving an error on starting client. Whats going on? Ok, so error 99 is a known error. Bugger. Ah well, I'll install the client at my work tomorrow.... More multicore power. Country:Dunno? but it ain't nice. LMK when u find any Aliens or cure Cancer lol? Let those 6 cores burn baby! !